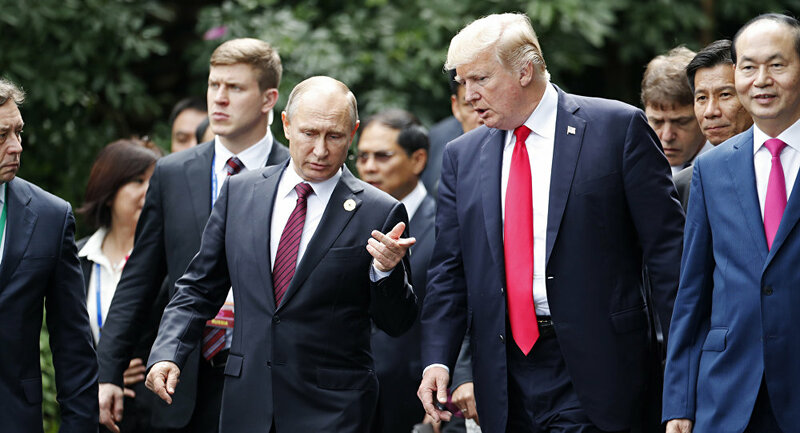 MOSCOW (Sputnik) – US President Donald Trump proposed meeting with Russian President Vladimir Putin in Washington when they spoke by phone last month, presidential aide Yury Ushakov said Monday. The telephone conversation between Putin and Trump took place on March 20. "If everything goes well, I hope that Americans will not change their mind about their proposal to discuss the possibility of holding a meeting. Trump proposed to hold the first meeting in Washington, in the White House, when our presidents spoke by phone," Ushakov told reporters. The Kremlin official mentioned the recent expulsion of 60 Russian diplomats from the United States, which led to a setback in US-Russian bilateral relations. "I hope that circumstances will allow us to discuss this topic [the meeting]. We believe that it is rather important, it is necessary not only for our countries but for the international community as a whole," Ushakov added. This information has been confirmed by White House spokesperson Sarah Huckabee Sanders, who stated that the top officials discussed multiple venues, including the White House. "As the President himself confirmed on March 20, hours after his last call with President Putin, the two had discussed a bilateral meeting in the ‘not-too-distant future’ at a number of potential venues, including the White House. We have nothing further to add at this time," the statement said. Diplomatic relations between the countries have further escalated over the Skripal case, which London blames on Moscow. Last week, displaying their solidarity with the UK, the US administration decided to expel 60 Russian diplomats and close the Russian Consulate General in Seattle over Russia's alleged involvement in the poisoning of Sergei Skripal, a former GRU colonel who also worked for UK intelligence, and his daughter Yulia in the British town of Salisbury. Moscow, for its part, has categorically denied the accusations, declared the expulsion of 58 diplomats from the US Embassy in Moscow and two employees from the US Consulate General in Yekaterinburg, as well as the closure of the US Consulate General in St. Petersburg. On Saturday night, US diplomats left the building of the Consulate General in St. Petersburg in line with Russia's demand for the consulate's closure. However, the US Embassy in Moscow said on Sunday that it would continue to work on improving US-Russian relations after the closure of the US Consulate General in St. Petersburg.